The Costs above are only indicative costs to guide you pick the right hotel. The per person rates is based on 2 Adults traveling together. Click on the hotel name below to get the actual cost of the package for your exact travel dates. You could also request for a tailor holiday or honeymoon package from here. 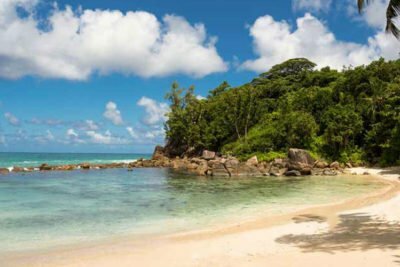 Seychelles is a perfect Honeymoon Destination made up of one hundred and fifteen islands (115) in the Indian Ocean, just off the East African Coast. Seychelles is popular for its coral reefs, beach, nature reserves, rare wildlife like the giant Aldabra tortoises and so much more. All these features make it to qualify as the perfect definition of an exotic Destination; voted severally as the best romantic destinations one can imagine. There are many resorts and hotels that suit all budgets, making it a perfect destination for your Honeymoon. The Mahe islands and Tropical Islands will cater for both the active and the solitary type of couples respectively. Here are 5 of the best honeymoon resorts in Seychelles to consider for a Romantic Getaway! Savoy Resort and Spa is located on the island paradise of Seychelles and is a 5-star resort. This modern facility was built recently and has attracted different couples who are in search of a perfect hideaway for their honeymoon. There is an expansive pool on this property and 163 spacious rooms. The rooms have air conditioning, which is controlled by the occupant and the balconies provide an excellent view of the island. There are two restaurants and bar for the guests in the resort, where you can enjoy all the local cuisines and delicacies. The natural vegetation on the horizons surrounding this resort create a tropical background to all the rooms and suites. Watching the sun rising and setting is a manifestation to behold. Enjoy the cool breeze in the evening while staying at this resort with your spouse. The vibrant style and the conspicuous landscape define the Kempinski Seychelles Resort. If you have a dream to spend your honeymoon in paradise, this is the ideal place to bring this dream to a reality. The island has unrivaled beauty due to the white sandy beaches the ocean view. This has been rated as the gem of the Indian Ocean and it is located on the south end of Mahe. There are so many facilities that are offered at this resort and you will be able to enjoy a combination of adventure and romantic experience. The suites have a breathtaking view and they will provide you with the escape holiday that will suit your needs. Pamper yourselves with the gourmet dining, indulgent spa, high quality sports amenities and so much more. This is a great location for a romantic holiday. AVANI Seychelles Barbarons Resort & Spa is the ultimate relaxing Getaway for your Honeymoon in Seychelles! AVANI Seychelles will take care of the details that matter so you can take it easy with your loved one. 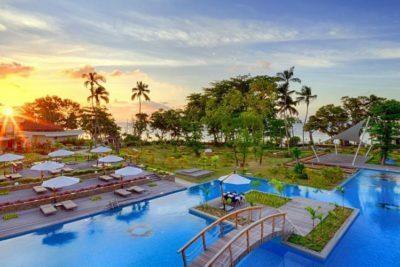 With your Honeymoon Booking, your romantic stay at this Resort in Seychelles will leave you spoilt with a private dinner on the beach under the stars, a bottle of sparkling wine, a room upgrade and spa treatment all included. Throughout your break enjoy discounts off delicious food, refreshing drinks and additional spa treatments to complete your Honeymoon break. DoubleTree by Hilton Hotel is a four-star modern resort, ideally located in Ane Forbans. The hotel sits on a private beach which is surrounded by the virgin lush tropical shrubbery. When you check in to any room, you will be able to enjoy the view of the Indian Ocean from the balcony when you are relaxing in the whirlpool. All the rooms are fitted with modern facilities including internet access and smart LCD TVs. When you get into the spa, you will be able to unwind and enjoy a sense of calm. You can work out to relieve your muscles and also dive into the sparkling swimming pool. The ocean view bar presents an opportunity to enjoy a magnificent sunset view. There is generally a great aroma that is in the atmosphere and the palm trees will create a cool, tropical breeze. Your honeymoon will certainly be an unforgettable experience. 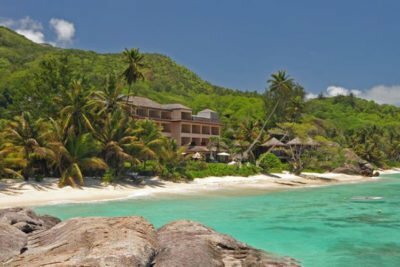 Constance Ephelia Resort Constance Ephelia Resort is located on a sandy beach overlooking Anse L’Islette bay, this sprawling resort with thatched roofs is 3 km from Morne Seychelles National Park. Constance Ephelia Resort Seychelles is located on the Island of Mahé and overlooks Port Launay’s Marine National Park. 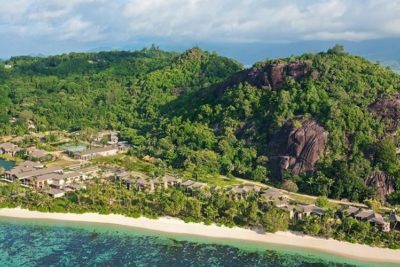 This Resort in Seychelles enjoys an exceptional location on 120 hectares of luxuriant land with rare vegetation. For your Honeymoon in Seychelles, choose from Constance Ephelia’s 42 Tropical Garden View Rooms, 184 Junior Suites, 40 Senior Suites, 16 Beach Villas, 8 Hillside Villas, 5 Spa Villas or our unique Presidential Villa. Feast on delicious dishes and cocktails as you marvel at the deep blue of the Indian Ocean with a private dinner on the Beach or in one of the Restaurants. Sum up your Romantic Honeymoon by pampering yourselves by a canopy of treatments from U Spa by Constance. Seychelles is an all year holiday and honeymoon destination. Experience myriad beaches, hidden bays, golden sands and secret coves as you sail between the inner islands that offer secure moorings. Find virgin territories inhabited by eye-catching lagoons and consummate opportunities for bottom, big-game and fly fishing within the outer islands that are basically atolls and coral cays. For scenic cruises, island-hopping excursions and snorkeling trips, professionally maintained, manned and operated catamarans and mono-hulls can be availed for bareboat or crewed charter. See the dazzling coral and granitic islands that are located around the cyclone belt. Denoted as the ‘the island of love’, Seychelles is an epitome of love affairs ranging from weddings and honeymoons. Seychelles is unrivaled as the island provides an idyllic ambience forming the backdrop of romance. Mahe island is ideally the best island in Seychelles for honeymoon. Mahe island is a great launching pad to visit all the other islands in Seychelles. We strongly recommend that you include island hoping in your Seychelles honeymoon itinerary. This will definitely spice up your honeymoon in Seychelles . Seychelles’ spas offer the ignition of a complete renewal of body, mind and soul with relaxing massages with scrubs, exotic herbal oils, detox baths plus the stimulating wet-treatments. Seychelles’ provides an awesome aura with a sanctuary well preserved that host prevalent species of flora and fauna, making it a scenic place to have walks and trails as you explore the naturally unique treasure the islands have to offer. For the divers of deep sea diving lovers, Seychelles presents diverse and spectacular diving opportunities, enhanced with the 1,400,000 sq. km of warm sparkling waters. If you are into fishing sports, fishing is a great experience in Seychelles as you don’t have to venture far away from the water shore to fish. Varieties of fish that can be found in the azure waters include the giant barracuda, wahoo, rainbow-runner, and the trophy fish among many others. We have a collection of Seychelles holiday packages as above. For couples planing a honey Honeymoon in The Seychelles, check out the Seychelles honeymoon deals under the Recommend for Couples hotels. You will realize Seychelles honeymoon cost is relatively low compared to many honeymoon destinations. Our Dealers are on stand by to assist you with your Seychelles holiday or honeymoon booking from Kenya. We will make your Seychelles holiday experiences unforgettable and full of fun. Talk to our experts today for a tailor-made package. Seychelles is a top rate Honeymoon Destination with Resorts that suite each and every taste. 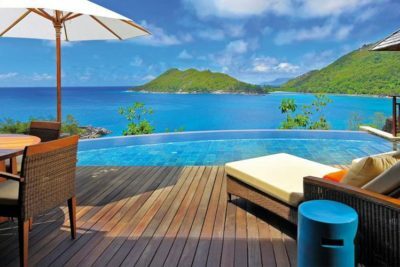 Book your Seychelles honeymoon package in any of these Resorts in Seychelles to enjoy the best of the Islands.